Though many may assume that orthodontics is only for children, the truth is that patients of all ages can benefit from a straighter smile. However, many adults are reluctant to seek care for dental alignment issues because they do not want to wear traditional metal braces. With Invisalign® clear braces from your Atlanta dentist, you now have a third option-straighten your smile discreetly, without the need for brackets and wires, and without calling attention to your orthodontic treatment. Contact our office today to find out if Invisalign® is right for you. Instead of relying on brackets and wires, Invisalign® clear braces utilize a series of clear acrylic aligners that are designed to gently guide your teeth into proper alignment. Rather than periodically tightening your braces as treatment progresses, simply switch your aligners as directed (typically every two weeks) to keep making progress toward a straighter, more symmetrical smile. The advanced technology used in planning and Invisalign® treatment can actually provide you with a digital preview of how your smile will look following treatment. 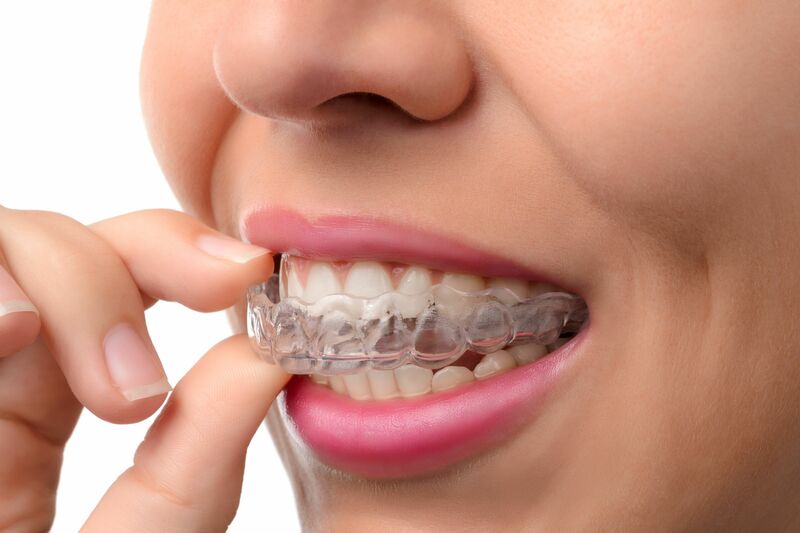 At Feather Touch Dental Care, we provide Invisalign® clear orthodontic aligners to give our patients straighter teeth. At our Atlanta, GA, office, Drs. Neal Shah and Donald Ross will evaluate your smile and provide you with a series of custom aligners. Invisalign® is a great alternative to traditional metal braces because they are simple and discreet. Many patients are excited to learn that they can complete their orthodontic treatment without the use of conventional braces, especially if they wore braces as a child. Braces can be inconvenient for many reasons. They make brushing and flossing your teeth more of a challenge as you navigate around the complicated brackets and wires. You also have to adjust your diet and only eat foods that won’t damage or stick to your braces. With Invisalign®, there’s little interruption to your daily routine. You can remove your aligners when eating and brushing your teeth, so you can continue enjoying your favorite foods and maintaining an effective oral hygiene routine. As single, solid appliances, Invisalign® aligners have no complicated parts. They feel comfortable against your lips and gums. Their custom tight grip allows for no movement and extremely low visibility, making them virtually undetectable. The duration of treatment is comparable to traditional braces. Invisalign® can be made part of a smile makeover treatment including porcelain veneers and teeth-whitening. In fact, your aligners can also be used to apply our professional take-home whitening gel to your teeth, allowing you to brighten your smile by several shades. Is Invisalign® Right for Everyone? Invisalign is generally recommended for older teenagers and adults who can abstain from darker beverages like tea, coffee and red wine. It’s important that Invisalign patients are able to fully commit to wearing the Invisalign® aligners for 20-22 hours each day. Patients who grind or clench their teeth or have severe bite issues should speak to our highly-experienced dental team at Feather Touch Dental Care to learn about additional corrective options. If you are interested in straightening your teeth discretely, with the fewest changes in your lifestyle, you may be a candidate for Invisalign® clear braces. Don’t wait any longer to achieve the straight, beautiful smile you desire. Contact us today to schedule a consultation.